Safely add 75-125 horsepower to 2003 and newer Dodge Hemi truck engine applications. The late model Hemi electronic fuel injected engines are the perfect platform for nitrous upgrades. The Hemi Truck Nitrous System has several unique features, including an in-line style fuel adapter that just snaps into place. The Hemi trucks also have a relatively high base fuel pressure, 58 psi, requiring a special jet selection that�s included in the kit for perfect tuning. Fully adjustable from 75-125 HP w/ supplied tuning jets. Perfect for mild to wild performance. A complete wet nitrous system. Everything is included for a safe, proper installation. Works safely on stock or modified engines; Naturally aspirated, turbo or super charged. 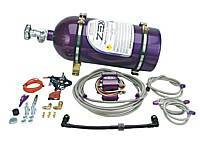 All major components are factory pre-assembled inside the Nitrous Management Unit; Easy, plug & play single afternoon install. The part number for this item is Zex 82176 and it fits 2003-2015 Dodge Ram 5.7 Hemi Trucks.